A number of friends have been asking us about these toddler stayovers. To be honest, the very first one was completely unplanned, completely and insanely spontaneous. The subsequent ones have been easier to manage for obvious reasons, both us and the kid staying over was ready for it. Humblet and her friend, Singlet (what he normally wears), have known each other pretty much since birth. Singlet's mum and I have been friends for more than two decades, so it's only natural for us and our kids to spend time together. Disclaimer first, they are really not at the age where they can play a game together. So time spent together, really means parallel play - you do your thing while I do mine. 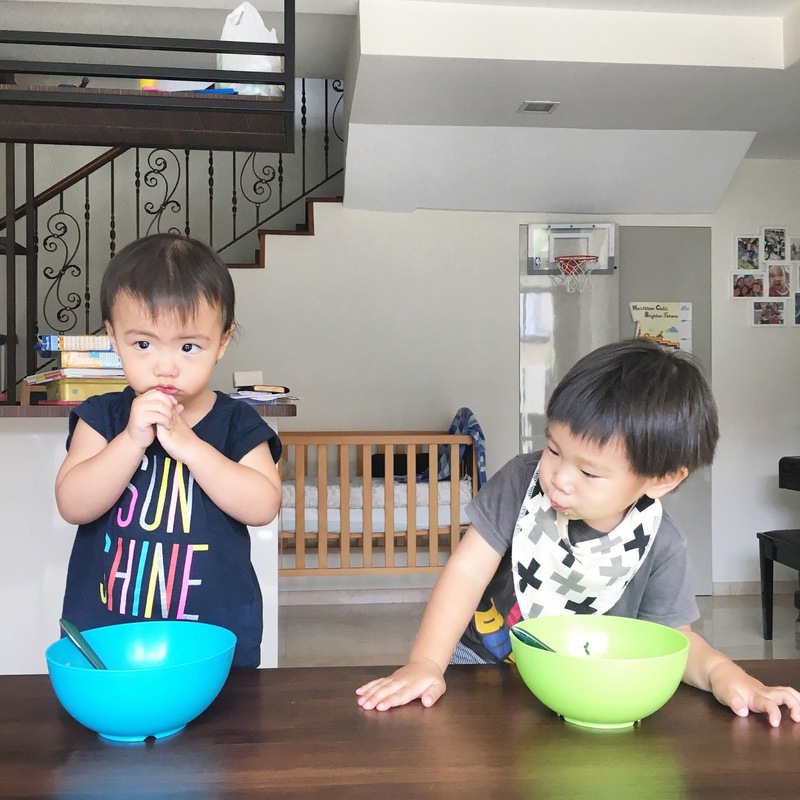 Most of their interaction occurs when they are having meals together, somehow both kids think the other kid's bowl has something more yummy in it even though they are eating the exact same thing. I do not get this. But here is photographic evidence for those of you who have been fortunate enough not to witness their food fights (yet). One evening, we brought Singlet out with to the library with us and somehow we spent so much time there that it was dark when we left. Since we were nearer home, we gave his mum a call and asked if she was cool with him coming over for the night (since he isn't of age to make decisions for himself just yet). Dinner went pretty well, they fought over what we put in the other's plate as usual, but the ride home was pretty uneventful. After bath time, we realised that humblet's pajamas were a little too tight for Mr Macho, but he was happy enough to strut around in them, belly protruding and all. Then another problem surfaced, we only had one milk bottle, so they had to (grumpily) take turns with that. Worse still, we realised we had no spare mattress, such that both kids had to sleep horizontally on humblet's mattress, thankfully they just about fit, if they bent their knees a little. We braced ourselves for a long night ahead. To our surprise, we were only woken up near seven the next morning with the banging of the child gate. Both kids had slept through the night! We were more than happy to be awake at dawn, since we had expected to be carrying sleepy anxious children that whole night. The night went so well, we didn't want to return Singlet just yet. So we headed out for an early Happy Meal and a short cycle to Coney Island. Bicycle rental is SO expensive, just saying. Other than that, the weather was great and it was early enough on the weekend such that we had no crowd to jostle with. We made a note to ourselves that this stayover business might just be possible with toddlers. The next stayover and so on, we were armed and ready. 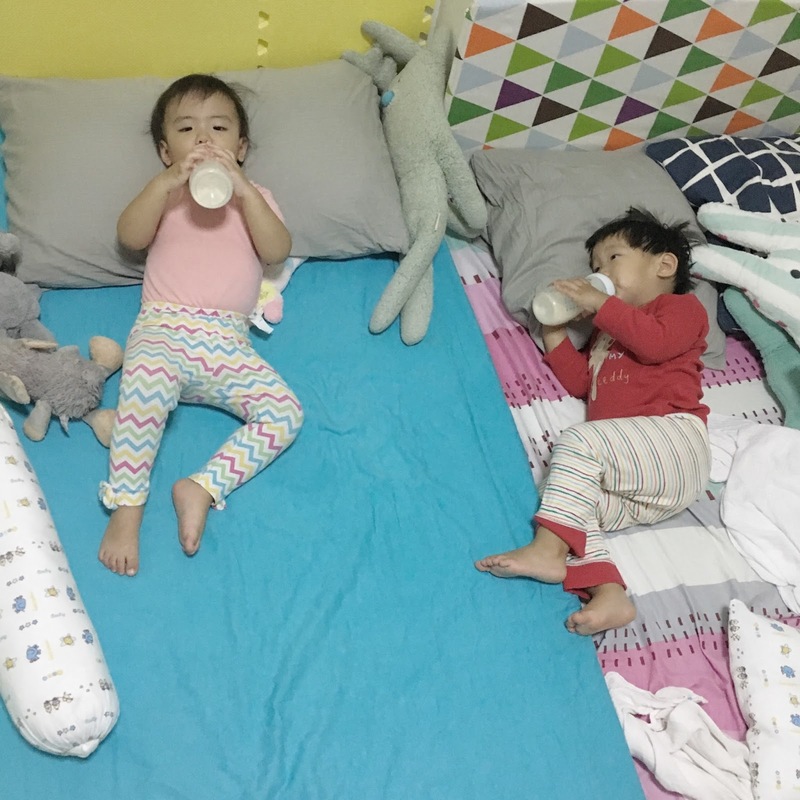 Pajamas check, milk bottle check and even blanket check. Having planned a stayover in advance also meant, Singlet had the opportunity to properly say his goodbyes to mum and his four siblings. It also meant prepardness on our part, getting a spare mattress, making sure there was enough food to go round etc. Personally, I found the very last stayover most rewarding, seeing how the kids really enjoyed themselves. They spent the evening chasing bubbles and were rewarded with a Choo-choo train ride when we bumped into my Uncle and Aunty just as it got dark. That evening, we were also able to sleep early, perhaps due to the expansion of energy as seen in the picture above. 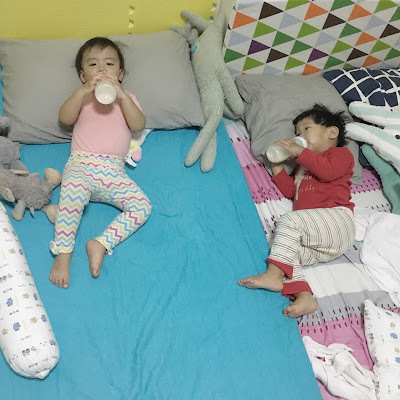 They both were content with having their own milk bottle, pajamas and mattress, such that they curled up to sleep almost immediately after lights out. This time also, we got another bicycle seat for Singlet so we didn't have to pay the exhorbitant bike rental fee - enabling us to clock a 20km cycle the next morning. It did drizzle midway, but not enough to have us running for shelter. 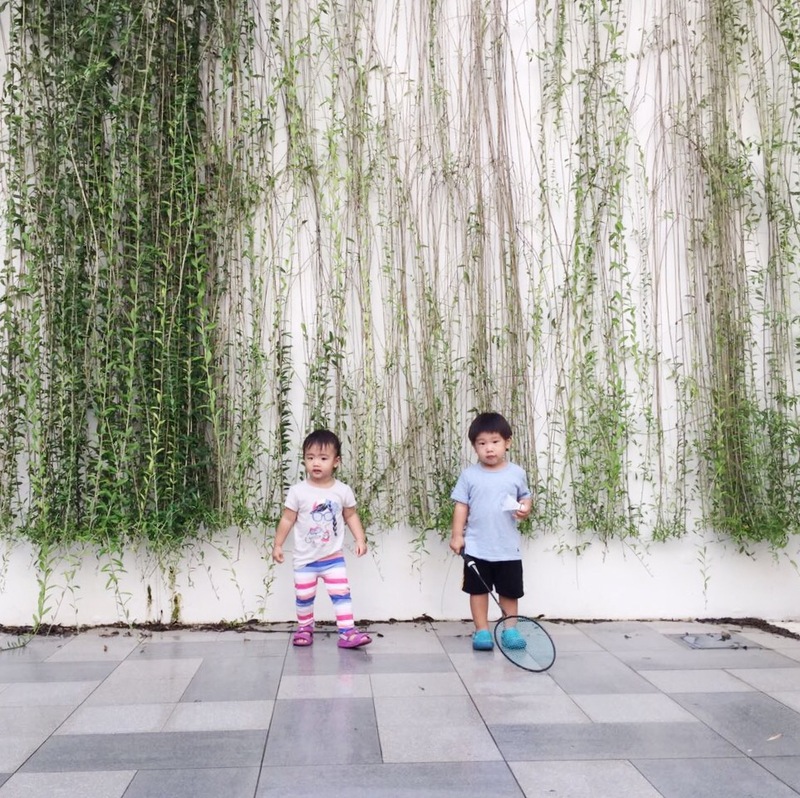 The highlight of the morning for the kids though was our random pit-stop at Whisk & Paddle. 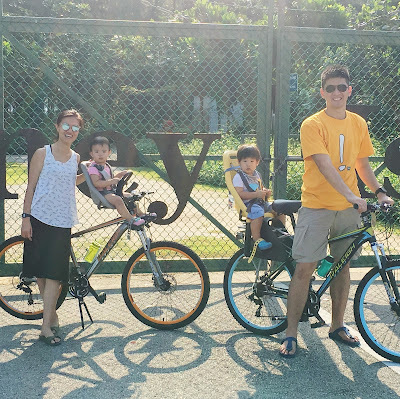 A spacious cafe facing the Punggol Waterway along Tebing Lane, about a forty-five minute cycle from the Buangkok Park Connector right below our block. We got in right as they were opening and ordered ourselves some iced lattes, while the kids got to unpack all the toys fresh out of storage. 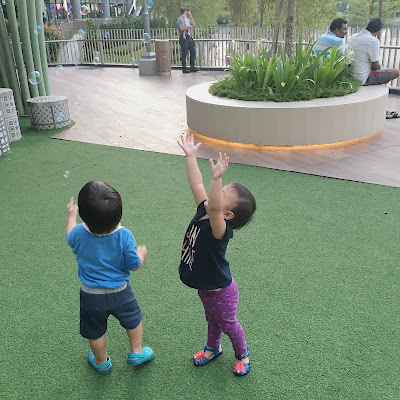 Best part was, they had the whole play area to themselves! 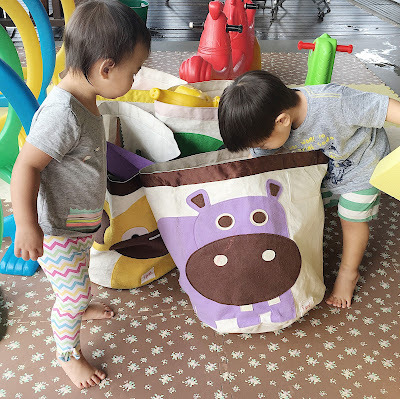 Mats, tubes, rocking toys and bags of plastic shapes and dinosaurs. It was a grand day, if I might speak on the kids behalf. And so, we're grateful to have Singlet over whenever. Humblet gets to spend extended time with her friend. Singlet's mum gets a one-fifth timeout. We get to explore new cycling routes and enjoy cafe time. It's been great. Would you try having toddler stayover?